It would be nice if some of the figures were red and white since the recent Roboforce drop was in those colors. I love it when various Glyos lines are released in the same color. It makes for greater build potential and uniformity. What do you know? What insider info do you possess?! I'm a sucker for dinos. I wish the Granthan's got their own dinosaur body. Spaced Out's new figures are incredible looking. What was in last year's anniversary drop? The archive hasn't been updated in a while, and I can't remember. I have so many ideas about this wave. I wonder if there was no roboforce released during the preivious Toyfinity drop because it will be in this drop. This also gives me the impression that this will be a gendrone heavy drop - the color just gives me those vibes lol. And with that said I would love to see that solid vibrant red on a gobon. Then with the word "invisible" in the drop title it makes me think of the stealth colorway, but with a lot of stealth figures still available in the store right now I doubt that will happen. However a stealth roboforce and gobon would be so awesome. rikdom wrote: What was in last year's anniversary drop? The archive hasn't been updated in a while, and I can't remember. Last years anniversary drop was "The Black Bridge of Glyosar." The archive isn't up to date however the glyos database mostly is (one drop behind) and I think is supposed to act as the new archive. Titan Skeleton and lots of line details on everything. Also my first drop. Ottman34 wrote: Then with the word "invisible" in the drop title it makes me think of the stealth colorway, but with a lot of stealth figures still available in the store right now I doubt that will happen. However a stealth roboforce and gobon would be so awesome. Don't rule out the possibilty of something that's never been offered in stealth. Or something that's never been offered...ever. Ottman34 wrote: I have so many ideas about this wave. 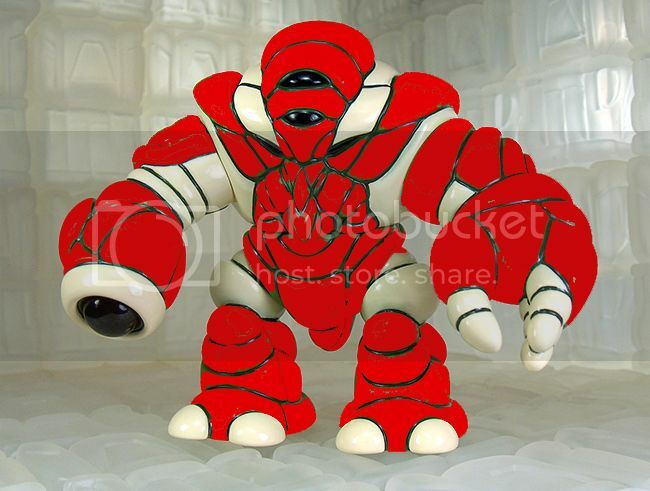 Second that Gobon, I'd really love to see a Red and White Super Cray, been a while since we've seen one of those big mama's it'd be sweet to see one in recent Toyfinity colors. I'm not ruling it out, I'm hoping for it! Also, I totally forgot about the Glyos Database. I'm new to glyos and I'm curious when waves normally drop? Arenova wrote: I'm new to glyos and I'm curious when waves normally drop? Roughly every month and a half, but there's less predictability recently due to Matt mixing it up. When you say every month like normally the first day of the month or later? It varies. You can check the drop dates by going through the old blog posts since Matt always posts a notification on drop days. This will be my 30th onell drop! Still waiting on stealth gobon!! Don't rule out the possibilty of something that's never been offered in stealth. I'm guessing Soldier of Darkness. Ooohhh.... A stealth RoboForce.... That would be very interesting! The "invisible elements" refer to some kind of secret collaboration. Enyriun shared a vision with the Cray twins, and rescued/retrieved them from Block Base. On the flip side, Cinar is heavily implied to be Argen reborn, but in a position even closer to Glyaxia. Maybe this drop refers to something coming out into the open that had previously been hidden from view. The "invisible elements" refer to a new entity making itself known. Maybe there has been someone or something pulling the strings from behind the scenes, but with all the chaos erupting in Glyos as of late -- the seeming death of Argen, the emergence of the Exiles, the forging of Glyarmor, the uncovering of Zeroids on Esdeth, and so on -- this being or force will now emerge to make a play for power, perhaps, or for some other goal. That being said, it's interesting that the teaser implies bright red as a colorway. Maybe a return to Reydurra is in order? Since the Darkness Soldiers were just released in that red/white color scheme, maybe it's the new Star Team insignia?